Your resource for all things shoegaze and dream pop: INTERVIEW: Raffaella and Marcus of etti/etta. 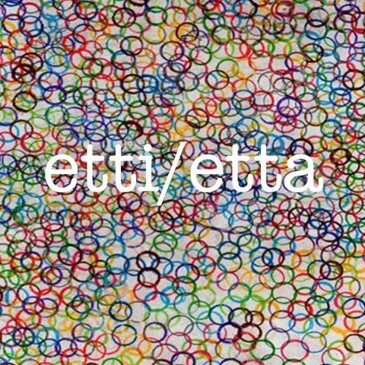 etti/etta is the Italy-based dream pop duo Raffaella (vocals/bass) and Marcus (guitar/synth/omnichord). Amid all of the wonderful records we’ve heard this year, etti/etta’s Old Friends stands out from the crowd as a particularly skillfully executed album with gorgeous soundscapes and intricate textures that are easy to get lost in. The album, which came out in August, features a satisfying mix of well-written songs blending shoegaze, noise pop, and post-punk to create their unique and distinctive sound. The band's love of warm, dense, lo-fi textures is the common thread that pulls the collection of songs together seamlessly as they cross and defy genre labels. It’s truly a gorgeous work and easily one of the best efforts of 2018. Enjoy getting to know more about Raffaella and Marcus in the following interview and definitely check out etti/etta’s Bandcamp page if you’re new to the band. Marcus: We met back in 2012, and we started sharing a lot of music we liked, and it turned out we were also both doing our own different musical things at the time. I come from a background of a lot of small bands and just writing my own songs. Raffaella comes from a very musical family and has been performing and singing since she was very little. I showed Raffaella some of my songs and she liked them, so we started working on a couple demos. That was the beginning of our first EP, No? Yes. Marcus: We just released Old Friends, our first full-length LP. We did it all ourselves, so It took a pretty long time, but it’s out in the world now, and we’re both really proud of it. Now we’re just starting to look into some more live shows to support the new record. We’re also both working on new music all the time, so it’s possible we might start to work on something new, soon (we hope). Raffaella: We don’t really like to identify with one genre, but if we had to name some, maybe post-punk, new wave. I feel that desire to be representative of one genre can be a kind of limit to creativity and inspiration because music takes so many forms. We do what we like. We listen to so many different kinds of music, that’s probably why we find categorization so hard. Marcus: I don’t think we feel like we’re necessarily a part of a specific scene, but it’s always really cool to see who likes our music. We’ve been really fortunate to receive a lot of support from DKFM, and many friends, and bands within that community and different shoegaze scenes - they’ve all been a huge support for us. Raffaella: Lately, we discovered the band Corasandel from the UK. Marcus: And check out our Toronto friends Vox Somnia. Raffaella: Marcus’ guitar first, and now synths are the most important thing for etti/etta. I think the sound is the product of personal research of Marcus, which does not mean necessarily searching for the coolest piece of gear that allows you to recreate a sound but experimenting and finding new sounds you like. Marcus: I think the most important part of our sound is Raffaella. Raffaella: We start with a sound, or an idea for the whole song. What comes after varies depending on the feeling and the inspiration we have from the sound. We like to work together developing our ideas based on the initial sound. There isn’t a defined process for every song. Marcus: Use whatever you’ve got. Raffaella: I love vinyl, I find it is probably the best format for listening to music for the quality and the warmth of the sound. When you put on a vinyl, music is there somehow physically too, and the whole process is just more beautiful, sounds are more immersive. I obviously can’t deny that most of the times I listen to mp3 or digital formats. I grew up listening to cassettes, so I have a soft spot for that, too. The cassette sound still makes sense to me, the sound still remains interesting, more than CDs. I like physical formats for music, that’s for sure. Marcus: I grew up with all three, and I like them all for different reasons. Any physical medium of music will enjoy some kind of nostalgia, given time, but I’ve always really loved cassettes. Whatever the format, I think physical copies are important because they allow people to form different kinds of relationships with their music.